The young people's mental health charity. YoungMinds is the UK’s leading charity committed to improving the emotional wellbeing and mental health of children and young people. More than 850,000 children and young people in the UK have been diagnosed with a mental health condition. 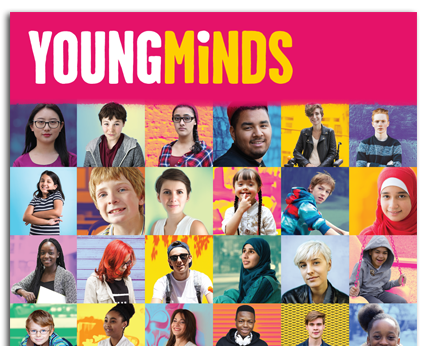 The last few years has seen a lot of change for YoungMinds. With a 5-year strategic plan on the horizon and a new phase in their development, the YoungMinds rebrand came at a critical time for this amazing charity. They invited us to refresh their brand, and it was a pleasure to work with such a hard working charity at such a pivotal point in their progression. The brief for the project was ‘a refresh, not a rebrand’. YoungMinds were already well recognised as experts in young people's mental health, and it was essential that they retained and built upon existing brand awareness. YoungMinds required a new youth focussed look that would work seamlessly across all channels, and harmonise existing sub-brands. We started by looking how we could adopt some of the ideas from the more youth-facing projects into the core brand. To achieve this we ran a series of workshops with key stakeholders. This generated a shared understanding of the immediate and long-term goals for the charity. Working with great in-house knowledge also enabled us to throw off previous 'brand shackles' and develop trust. This meant we were able to get to the heart of what the YoungMinds brand could, and needed, to be. We also ran brand workshops with groups of young people, the YoungMinds Activists, who helped us shape the imagery and tone in a way that resonated powerfully with young people. From the start, we aimed to keep the process fun and collaborative. We made timelapse videos of ideas scribbled on our whiteboard wall (see our video on the right). We gathered visual moodboards, created mock-ups of our ideas, and kept presentations informal and open. We even splashed a lot of paint around our studio. We purposefully kept the design process flexible, open and cyclical. The new YoungMinds brand needed to feel vibrant and youthful. Their brief specified that it should be 'personal, positive, uplifting and have some heart and humanity'. So, by involving the YoungMinds team and young people in the process, it automatically kept it fresh and it evolved organically into a solution that perfectly achieved the brief. We are really proud of the outcome! Inspired by the typography and textures used in the YoungMinds Vs sub-brand, we hand drew a custom lettermark. We switched the colours to put emphasis on the word 'young. This felt like it worked with YoungMinds purpose much more sympathetically. We also developed the dot of the 'i' so that it became a feature that can act as a standalone icon, representing an individual young person or a head full of ideas - a flexible icon and mascot that could be developed into its own identity in the future. The outcome is a fresh and vibrant logo that is still unmistakably YoungMinds. During the rebrand process, it became clear that there could be no ‘one size fits all’ for the YoungMinds brand. The charity works hand-in-hand with young people, but they also need to talk to parents, schools, the government and local services. To allow for this, we developed a Brand Toolkit; a suite of flexible brand assets that could be selected from, as and when they were needed. The toolkit includes colour schemes, textures, iconography, graphics, and imagery, with guidance on how to apply each element. Once the brand was signed off, we worked with YoungMinds to retrofit their existing marketing materials and provide the assets to allow them to create new ones. This ranged from stationery, PowerPoint presentations, formal reports, clothing, brochures, flyers and web graphics. We worked closely with the team at YoungMinds to guarantee that they had the tools to manage day to day design output in-house. YoungMinds are now equipped with a vibrant, flexible brand and all the tools they need to deliver their essential work as a charity.